Willingness to take to the streets determined by personal circumstances rather than slogans. Some 11-12 percent of Russians feel ready to take part in protest rallies, according to the Public Opinion Foundation (FOM) polling organization; this proportion has remained virtually unchanged since the beginning of the year. 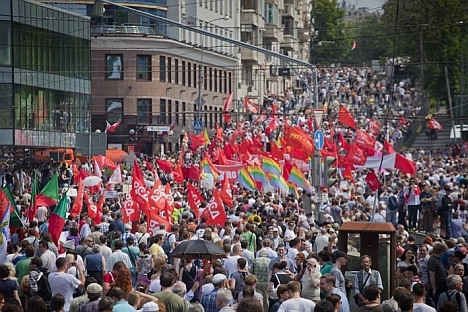 An FOM public opinion poll of 1,500 Russians conducted on June 9-10 revealed that the level of protest moods in the country has remained virtually constant since the beginning of the year. Eleven percent of the respondents said they were ready to participate in rallies. In mid-March, following the first “March of Millions”, 12 percent of respondents said they felt ready to take part. At the beginning of the year, the share of those ready to take to the streets was estimated at 15 percent. The protest trend peaked in the second half of 2011 at 23 percent. The share of respondents unwilling to protest had stabilized at 82-83 percent by early summer. Oslon said: “There aren’t many real factors effectively shaping public moods. These are mostly down-to-earth reasons, especially lack of money or a job.” Currently “speculative ideological” reasons are mostly employed to call on people to join rallies, which is why the proportion of potential protesters remains unchanged, he added. If a rally were to be held in the near future, 61 percent of respondents would back neither the supporters nor the opponents of the authorities, according to FOM. Only just over 3 percent of the respondents are ready to take part in a rally to support the government, whereas some 9 percent say they support the authorities, but would not attend a rally. Seven percent of respondents said they would take part in a rally to protest against the official authorities. This is a one-point increase over the previous month, but the level has remained virtually unchanged since early January. First publihsed in Kommersant FM.